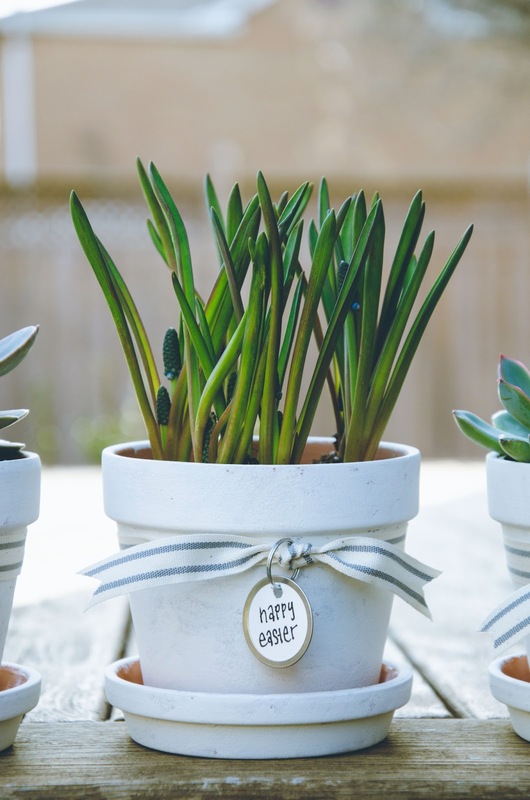 How to give a shabby chic look to plain terra cotta flowerpots and personalize them for a pretty hostess gift this Easter and spring. I followed what is pretty much a formula for me. Take a multi-purpose container (flowerpots are my favourite) + embellish it a bit and add a personal or seasonal touch + fill it with something pretty/tasty/useful = fabulous gift/decor/organizer. You can see other versions of it here and here. There’s nothing complicated about this one. Here’s what I used… Terra cotta flowerpots which can be had in many sizes from many kinds of stores…mine are four-inch pots from the dollar store, two for $1.25 plus the saucers three for $1.00. Some antique white craft paint and a foam brush from my craft supplies. Retail tags (which I keep a big stash of). They have them in the scrapbooking supplies or sometimes the gift tags of a craft store. I get mine at Staples in the retail supplies. A new roll of vintage-feel ribbon from Creative Bag which inspired this look. Then some four-inch plants from the greenhouse…I got some succulents and grape hyacinth. I painted just one coat of paint on the outside of the pot and the saucer. Using sort of a criss-cross stippling effect with the tip of the foam brush gave it a bit of texture and left some spots unpainted for a sort of imperfect, vintage-y, shabby chic feel. With only one coat of paint the finish was also more matte than glossy. By the time I had finished painting the third set the first one was dry. I wrote a “Happy Easter” message on one side of each tag and a monogram of each lady’s first initial on the other. So that the tag could be flipped around after Easter and still be part of the pot, and give it a personal touch. Any message could be written on the tag…for a birthday, Mother’s Day or thank-you… I threaded the tag through the ribbon and tied it around the pot. Then I set the plant inside and done! It probably took me about twenty minutes to make all three of these after I had the supplies assembled. Twenty minutes of fun therapeutic craftiness. And look how pretty they turned out! I love the little succulent in mine. I’m really hopeful that I’ll be able to keep it alive. But if not this pot will find a new home holding pens, or cotton balls, or maybe tealights…who knows? Maybe I’ll try an ivy. For now it’s sitting here by a window as part of a little Easter vignette in the sun. Is that where you’re supposed to keep succulents? I guess I’ll find out, but help me out if you know.